If you want to make one mind-blowing chicken wings recipe, then that has to be this dry rub baked chicken wings! I have ample chicken wings recipe in my blog because me and my hub, we both are insanely addicted to anything chicken wings! Chicken wings can be the best finger food which I discovered while exploring new recipes for our blog. Good news is that I found another stunning chicken wings recipe that is today’s dry rub baked chicken wings and it simply knocked me out! 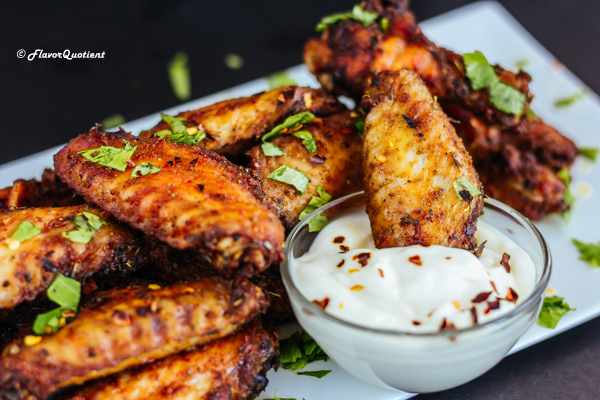 A mix of all flavorful dry spices coats the chicken wings and after they are baked golden brown, you get treated with the most amazing dry rub baked chicken wings! I can’t say if it’s the chicken wings or the aromatic spice blend that got me hooked to this dry rub baked chicken wings! Chicken wings taste great both ways – fried or baked and you will find multiple options here on my blog. 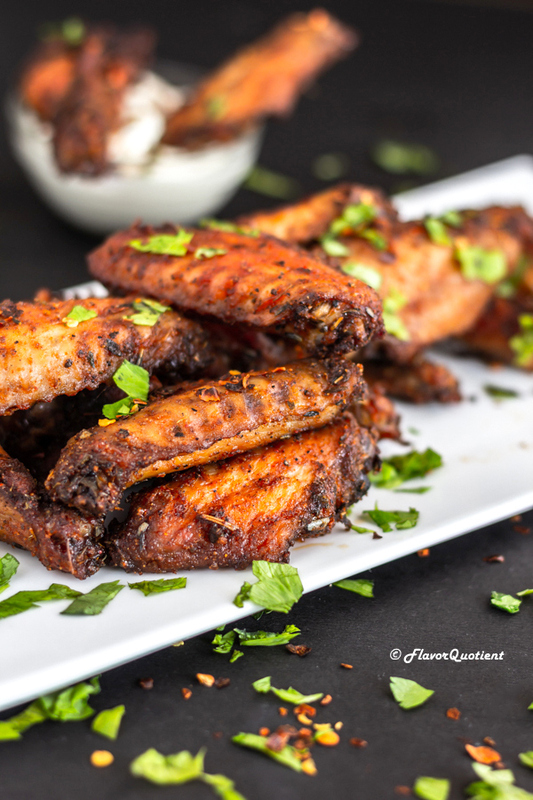 And today this epic recipe of dry rub baked chicken wings is added to the list which I am sure you all will love as much as we did! You really can never have enough recipe of chicken wings; hence it’s good to collect as many as possible and keep your repertoire up to date so that you can churn out one after another surprising chicken wings dish for your friends and family or just to treat yourself! Demand of such tasty finger food is steadily rising and I love to be always fully prepared! The dry spice mix which I used in this dry rub baked chicken wings recipe is all-in-one spice blend which can be used not only on chicken wings but also on shrimps or any other seafood. I would also love it sprinkled on top of my pasta as I love the flavor of Italian seasoning which complements any pasta dish beautifully. This dry rub, which is a mix of garlic & onion powder, paprika and some Italian herbs, has endless possibilities; so you can make a bigger batch and store it in an airtight jar to keep it handy. The quantities mentioned in the recipe below will just be enough for the dry rub chicken wings dish with 500 grams of chicken wings. Before coating the chicken wings with the dry spice rub, make sure to pat dry the wings as thoroughly as possible. Dry chicken makes baked chicken crispy while keeping the meat juicy and succulent, also the spice adheres to the chicken pieces more deeply. In the recipe instructions below, you will see my recommendation of adding half of the spice rub at first, coating the chicken with it and then adding the remaining half; this is essential for letting the chicken wings absorb as much spices as possible. 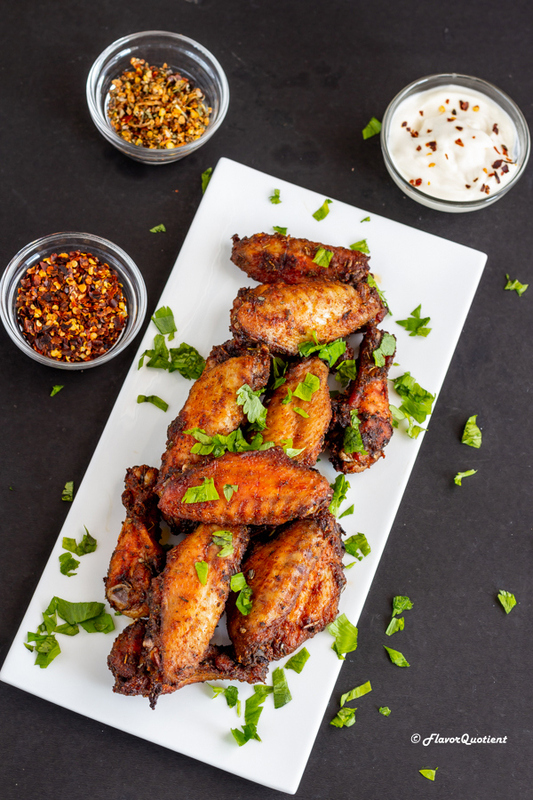 If you follow these couple of tricks, nothing can stop you from creating the most amazing restaurant style dry rub baked chicken wings at home! 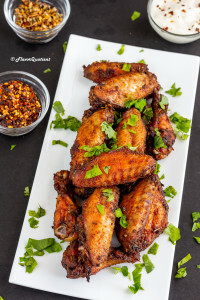 If this chicken wings dish is little too spicy for you, you can hop over to my baked garlic parmesan chicken wings recipe! You are welcome! Preheat your oven to 180 C / 375 F.
Cut each chicken wing into 3 parts – drumette, winglet and wing tip. Discard the wing tips (or save them for making chicken stock), wash and thoroughly pat dry the remaining chicken wings. Take the chicken wings in a large bowl and drizzle the olive oil all over. Give them a quick toss. In another small bowl, add all ingredients listed under dry rub and mix well to create a uniform spice mixture. Now sprinkle half of the prepared dry rub on the chicken wings and using your hands massage the spice on chicken wings very well so that the spices coat each wing thoroughly. Then sprinkle remaining dry rub and repeat massaging them so that each wing is well-coated with the spice mix. Now line a baking sheet with aluminum foil and place a grilling rack on top of it. Brush the grilling rack with oil to prevent the chicken wings from sticking. Arrange each chicken wing on the grilling rack in a single layer and bake them in the preheated oven for 45 minutes or until they are charred on the edges flipping them over once in the midway. Serve the dry rub baked chicken wings with ranch dip or simple mayo. Enjoy!